Golden Apples: A 1,000 Posts! And It's My Birthday, Too! And Best of All for you, dear reader—a Blog Give Away! I started this blog with good intentions—and hoped one day to have a reader or two. I have been blessed with hundreds of readers. So its only fitting as I reach this milestone, I reward my readers, new and old. I've always thought of myself as a writer, and have written technical manuals, and short columns for small magazines, but this blog is the most consistent, longest running work I have done. I not only think of myself as a writer, I AM a WRITER. 1000 posts in 6 years averages about one post every 3 days for the past 6 years—but in reality, at first, my post were inconsistent, and there were gaps of weeks and days between postings. This past year, (actually the last eighteen months or so) I have tried especially diligently to post 5 times a week—most often Monday to Friday; occasionally when I miss a weekday post, I'll fill in on the weekend. Daily or near daily posts, month in and month out. It's work, (not that I get paid for it) but it's work I like. And my present to you dear readers-- Well, it's not with out work on your part. 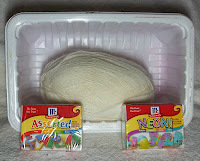 Post a link to this blog -TODAY-on your blog or your favorite knitting forum or networking site and mention this give away. (NOT on the big 6 of Ravelry though). Post a comment on this blog and mention where you've posted your link. Wish me a happy birthday, too, when you post. Your reward? You'll be entered in a raffle to one of 4 great prizes. You'll have 1 extra day to post--and to wish belated birthday greetings. And then its done! A fast contest--just 2 days to post a link and make a comment. And be sure to check back when I post winners later this week--so you can claim your prize. First: A deluxe project bag, complete with needles, sock yarn, a matching notions bag—filled with notions, like a tape measure, a folding scissor, and other notions and bonuses. 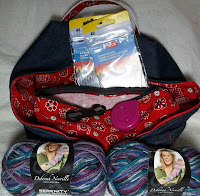 Second: A project bag, with needles, and sock yarn, and some notions. 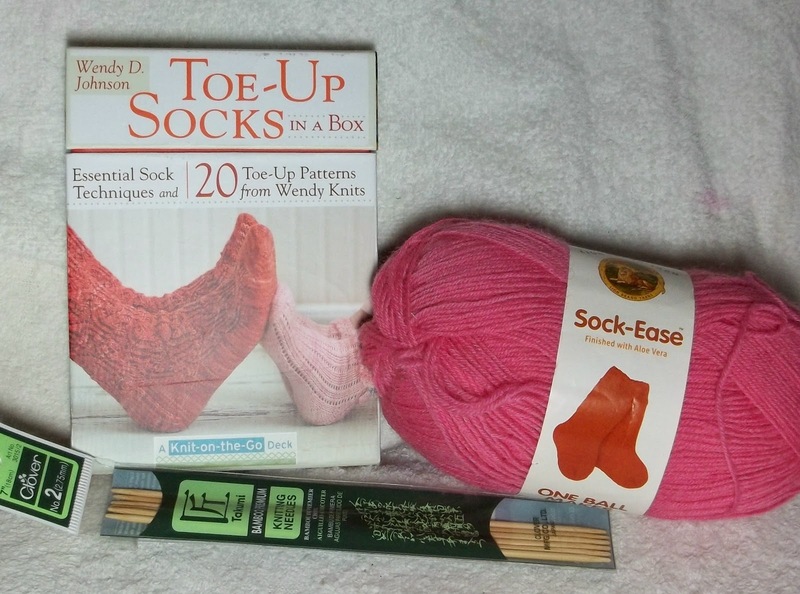 Third: A book in a box (Wendy Johnson's Socks from the Toe Up), sock yarn and needles. Fourth: A hank of white sock yarn, a small plastic pan for a dye pot, and 2 sets of food coloring for dye matter, so you can make your own hand painted sock color way. The first place winner also gets first choice of the sock yarns (Deborah Norville's (50% merino, 25 Bamboo, 25% nylon), or Paton's Kroy, or Lion Brand Sock Ease) and the needles (2 Inox circs, or 3 Susan Bates circ's, or a set of Clover DPN's) that they would like in their kit. The 3rd place winner gets what ever hasn't been chosen. Each prize is, I think, first quality. And there are lots of patterns for sock and small shawl made from sock yarn, that even the non sock knitters will be happy. It's a 2 day only contest—so get started! Well, Happy Birthday Helen! And wow, a thousand posts! Congratulations! I wish whomever enters the contest the best of luck! Happy Birthday Helen! 36, huh? That is a big birthday! And congrats on your 1000th blog! Happy birthday! I think 1000 blog posts is quite something. And what a wonderful giveaway are you hosting, the stuff looks lovely! You can find my notification about it here: http://www.ravelry.com/discuss/wish-upon-a-star/1980734/226-250#242. Happy birthday, and best wishes for a wonderful, happy, healthy year! 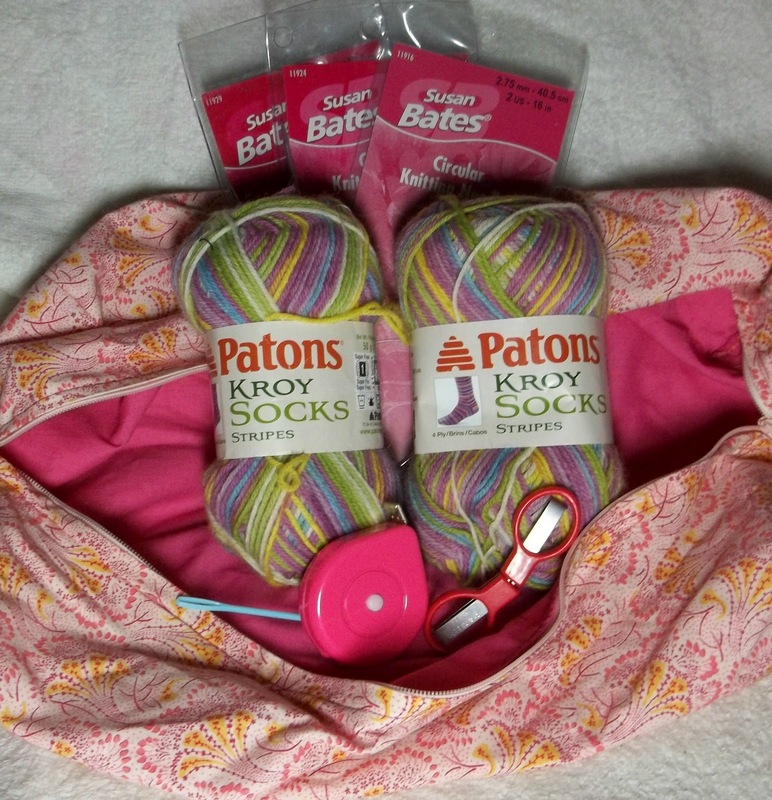 I posted a note about this generous giveaway on Rav in the Wool-Aid group. The folks there knit heavy warm sweaters, vests, socks, mittens, etc. to send to needy children in the coldest parts of the world, and I thought they might like the chance to win a treat for themselves. (that is, "A Very Happy Birthday with love from Pooh" (or Kangath, as the case may be)). I linked to your post at Knitted Bliss. HAPPY BIRTHDAY, hope you have a GREAT day!! I posted on FB for my stitching friends. Happy Birthday, Helen! Hope you have a fibery great day! Happy Birthday! (you should be getting presents, not giving them away...lol) I enjoy reading your blog posts. Happy Birthday and 1000 postings are great. First time I'm visiting your blog. Happy birthday and congrats on the 1000 posts! Your blog has long been an inspiration for me in both productivity and creativity. Happy Birthday to the Birthday Grrrl! This is a lovely post and I will have to come back to read it. Ceramics day! Wishing you Wonderful Birthday and no one deserves that wish more! Happy Birthday 2-Yew! I am a Dragonista also - and also don't need to mention what multiple of 12 I'm marking in a few days. Have a wondrous celebration! How awesome that you have 1000th posting. I really admire you. I've just renewed my blog and it's been never easy to keep giving lots of love and care to it. I hope you enjoy writing even more and have lots of fun out of it. Happy Birthday!!!! Linked to your blog on Ravelry group ----- Contestants - Enter Here. Thanks for the giveaway! Happy birthday! You don't know it, but you taught me how to double-knit! (I learned by reading your posts.) I hope you have a very merry day. I came back to read the post in full, and found you're lovely prizes. I've linked to your post on my blog this morning. Thank you for all you've done to keep me knitting! A KAL starts today, and my rekindled mojo plus all the stuff goes with me to my sister's so I can knit there. I'm not sure what Year is mine on the Calendar, maybe the Horse? I'll go check. Such fun! Happy birthday! So impressed that you've been blogging for so long. 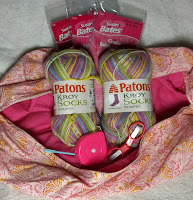 I tweeted the giveaway and started a thread on in my podcast's group on ravelry here. I heard about your blog and the giveaway from lgesin of Blog Like It's The End Of The World! Happy Birthday! Hope it was a wonderful one. Thanks for the fun. I posted a link on Facebook! I just came over from ZippiKnits and thought it apropos for Golden Oasis to wish Golden Apples a very happy birthday! I tweeted (https://twitter.com/#!/cmouse01/status/197762337220997121) and will post later to my blog (but I don't have a link yet). Ack! I forgot to wish you a wonderful, Happy Birthday! Congrats & Happy Birthday! What lovely prize packages too. And I posted your blog on my google plus! =D I don't have a facebook. Happy Birthday! Congratulations on your 1000th post. Happy belated birthday to you!!!!! It was also my parents' 47th anniversary...a day of celebrating! Happy happy birthday! and happy 1000th post! I am going to post a link onto facebook - hopefully you will get a lot of birthday wishes! Have a very, merry birthday! Currently, I am engaged in pattern writing—specifically for knittng, but I also blog and maintain a web page, make videos, and... the list goes on. Happy Birthday! what a wonderful way to celebrate with all of us.